Griffen McCandles has just graduated from college and is not overly concerned about his future. Griffen is a card sharp, having picked up the game early in his school career and discovered he has a talent for gambling. He is surprised by a summon from his uncle, a successful business man who raised Griffen and his sister, Valerie, when they were orphaned at a young age. The story his uncle tells him at this meeting is so fantastic, the new graduate begins to question the old man’s sanity. Griffen is informed that shape-shifting dragons still roam our world. They are not myths but real beings who had to disguise their presence from humans as a matter of self preservation. What’s even more incredible is that Griffen and his sister are also dragons and will soon reach a stage in their lives when their latent nature will make itself known. He is also told that because they are from a lineage of very powerful dragons, there are other dragon clans very concerned with their development. Some will feel threatened by them and go to any means to nullify that threat, to include murder. While others will seek their alliance and support. Griffen leaves the meeting convinced his uncle needs psychiatric help. Then he is approached by a well known senator wanting to know where his allegiance lies. Confused, Griffen attempts to confide in his long time girlfriend, only to discover she is actually aware of his supposed dragon nature. Before he can question her further, she disappears. Frantic to reclaim his grip on reality, Griffen decides to find Valerie and share his unbelievable tale with her in hopes she can make some sense out of it. On the road to her college, he is set upon by two assailants in pick-up trucks who attempt to run him off the road. Surviving the encounter, Griffen is more determined then ever to get to the bottom of things. The early part of this adventure moves well but the plot really kicks into high gear when Griffen, via the advice of an old friend, goes to New Orleans, accompanied by Valerie, to meet an old black man named Mose. 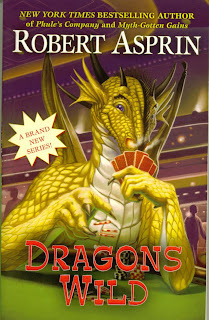 Mose is also a dragon and he manages an illegal gambling organization. He wants Griffen to take it over and become the new boss. Soon Mose is Griffen’s mentor and teacher and the young man begins to learn the amazing destiny he has inherited. Aspirin’s description of the city, in particular its notorious French Quarter completely charmed me and I really enjoyed following Griffen on his journey to self-dragon-discovery. His relationship with Valerie is also a fun and Aspirin creates marvelous supporting characters that inhabit Griffen’s new Cajun world. So well, in fact, you can almost hear the jazz and smell the gumbo on every page. DRAGONS WILD is a fresh, innovative fantasy and a wonderful opening chapter to what is planned as a series. It builds a world I truly enjoyed visiting and very much want to go back to again really soon. Put it on your short list right now. You’ll be glad you did.